Belkin 36-Piece Demagnetized Computer Tool Kit with Case $20.82 + FREE Shipping with Prime! You are here: Home / Great Deals / Amazon Deals / Belkin 36-Piece Demagnetized Computer Tool Kit with Case $20.82 + FREE Shipping with Prime! 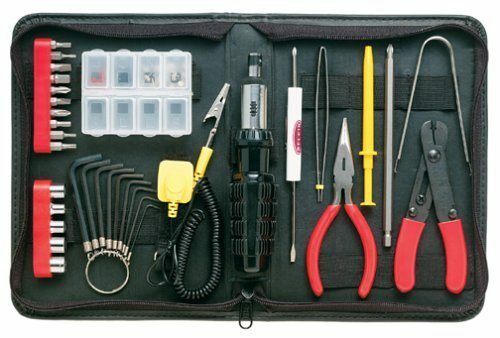 Head over to Amazon and get the Belkin 36-Piece Demagnetized Computer Tool Kit with Case (Black) for just $20.82, down from $49.99. Shipping will be FREE with Amazon Prime or an order of $35 or more. All tools are fully demagnetized to protect your computer’s hard drive or magnetic media from damage and each tool is conveniently stored in a custom designed case. This kit includes: 9 Pc. Allen wrench set, 2-Way Mini Screwdriver, 1 Phillips, 1 Flat, 2-Way Phillips/Regular Screwdriver, 5″ Long Nose Pliers, 6″ #1 Phillips Screwdriver (150mm long), Screwdriver-to-Socket Adapter, Anti-Static Wrist Band, Black Zipper Case, Color Box, Flat Head (6, 5mm), IC Extractor, Phillips Head (#2, #1), Reversible Ratchet, Socket (10, 9, 8, 7, 6mm), Spare Parts Box, 3-Pronged Parts Retriever, Torx Bit(T25, T20, T15, T10, T8), Tweezers.